I’m away from my home to see about getting a problem with the Tahoe fixed. It’s one of those intermittent issues where it could be a switch, sensor, computer or a mechanical part going flakey. I’m at a GM dealer while Mrs. Crucis’ Vibe is being checked out. We received a recall on its computer. So here I wait for the next two hours. At least I can surf via my phone. I have another post in queue if/when I get home. My birthday was yesterday. I’ve now lived longer than my mother. She died five months short of her 64th birthday. Utah is considering bring back silver and gold backed currency. Nixon stopped backing our currency in silver and gold. Perhaps it’s time to go back to a commodity based currency? Only problem…there’s not enough gold and silver in the world to cover our debt. I mentioned last week that I traded off my Chevy Equinox for a Chevy Tahoe Z71. Old NFO wanted a photo. Here it is. This is for you, NFO. 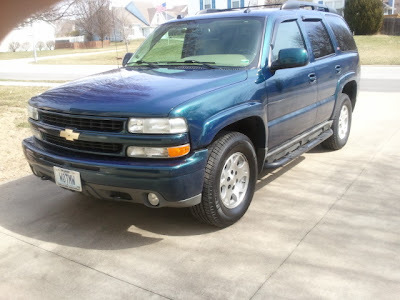 The Tahoe has an unusual color—it’s Blue-Green. Outside it looks blue with green metallic specks. Inside it looks green. The title says green but to me it’s blue. I traded in a 2005 Chevy Equinox on this 2005 Tahoe. The Tahoe has more miles than my old Equinox. The Equinox got 19-20mpg in town and 25-26mpg on the highway. I don’t know yet what mileage the Tahoe will make but I’m confident it won’t be that of the Equinox. Why would I make this trade? It Equinox was just too cramped. Any drive of more than an hour or two would nearly cripple me. I prefer something larger than a roller-skate on rubber tires. Mediocrity prevails. The Dayton Police Department is lowering their admittance standards because not enough blacks passed the tests. Worse, they’re being forced to do so by the Feds. That’s what we want for our Police—the bottom of the barrel of applicants. Our FedGov strikes again. This will be a short post today. My car has been in the shop since yesterday morning getting a variety of ailments fixed. All-in-all, it’s expected to cost me $1,000 before everything is finished. One nagging problem that will cost half of the bill was tracking down a computer alarm—emission failure. Apparently there is a leak in either the exhaust or fuel lines and is being picked up by a sensor. The good part is that they’ve narrowed the leak down. The bad part is that they’ll have to drop the gas tank to get to it. $200-250 for labor plus parts, maybe another $200-250 for the parts. Then add on a new water pump (leaking coolant) and new brake pads on the front. That’s a lot of money on a car I plan to trade in a few months. However, I’d rather spend $1,000 now that lose $2,000-3,000 in trade-in value in a month or two. When you look at from that point of view, the cost is worth doing. At the moment, I’m waiting for the phone to ring from the shop. It’ll be a race. Will the car get finished before the freezing rain and 3-5″ of snow forecasted for today arrives? In the mean time, here’s a cartoon for your enjoyment. Update: (9:34AM). I’ve lost the race. The freezing rain and sleet has already arrived. We’re still recovering a bit—me mostly. 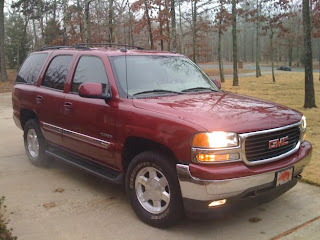 The trip to and from Indy was uneventful but ohhhh how I wish I still had my Yukon. I bought a slightly used, dark red GMC Yukon in 2003. I loved that truck/car/SUV. It was big. It had plenty of leg room. It was comfortable with gray/tan leather interior. It was everything I’d wanted in a vehicle—except for its 15mpg mileage. The photo to the left, while not mine, matches the one I owned. The key item is “leg room.” My current auto, a 2005 Chevy Equinox, is a good car for local driving and short day-trips. But for anything over a hour or two, it becomes cramped. Really, really cramped! I drove my Yukon on a 4,000 mile trip the summer after I bought it. We took off towards the Sand Hills area of Nebraska and west up to SW South Dakota stopped along the way at Mt. Rushmore and Sturgis, SD. From there we traveled further west into Montana to see Custer’s Last Stand and then down to see Yellowstone and the Tetons for a 2nd time. This morning, I stood up along-side the bed and took one stiff gingerly step after another to the bathroom. My feet are still extremely tender and I feel a couple of decades older. Right now I’ve gobbled a couple of Tylenol and in a hour or two I’ll slip off for a shower. I figger that by noon, I’ll be moving close to normal. I have learned that small cars and long travel times do not, for me, mix. I traded off the Yukon in a fit of pique when it cost me $50 to fill its 25 gallon tank. One tank would last me for a week of work commutes. I don’t drive that much now. For the last few years I’ve worked from home and now I’m “retired.” One 12 gallon tank in the Equinox lasts me two weeks. I can now afford to feed that Yukon that I once owned. My Equinox and and Mrs Crucis’ Vibe are paid for. It’d almost be worth another car payment if I found another Yukon…or Tahoe…or even a crew-cab pickup that fits better than the Equinox.